Reprint. Originally published: London: Profile Books, 2017. What happens when you reach the threshold of life and death - and come back? As long as humans have lived on the planet, there have been wars, and injured soldiers and civilians. But today, as we engage in wars with increasingly sophisticated technology, we are able to bring people back from ever closer encounters with death. Historian Emily Mayhew explores the reality of medicine and injury in wartime, from the trenches of World War One to the plains of Afghanistan and the rehabilitation wards of Headley Court in Surrey. 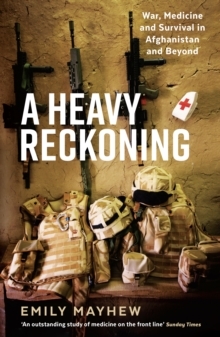 Mixing vivid and compelling stories of unexpected survival with astonishing insights from the front line of medicine, A Heavy Reckoning is a book about how far we have come in saving, healing and restoring the human body. From the plastic surgeon battling to restore function to a blasted hand to the double amputee learning to walk again on prosthetic legs, Mayhew gives us a new understanding of the limits of human life and the extraordinary costs paid physically and mentally by casualties all over the world.